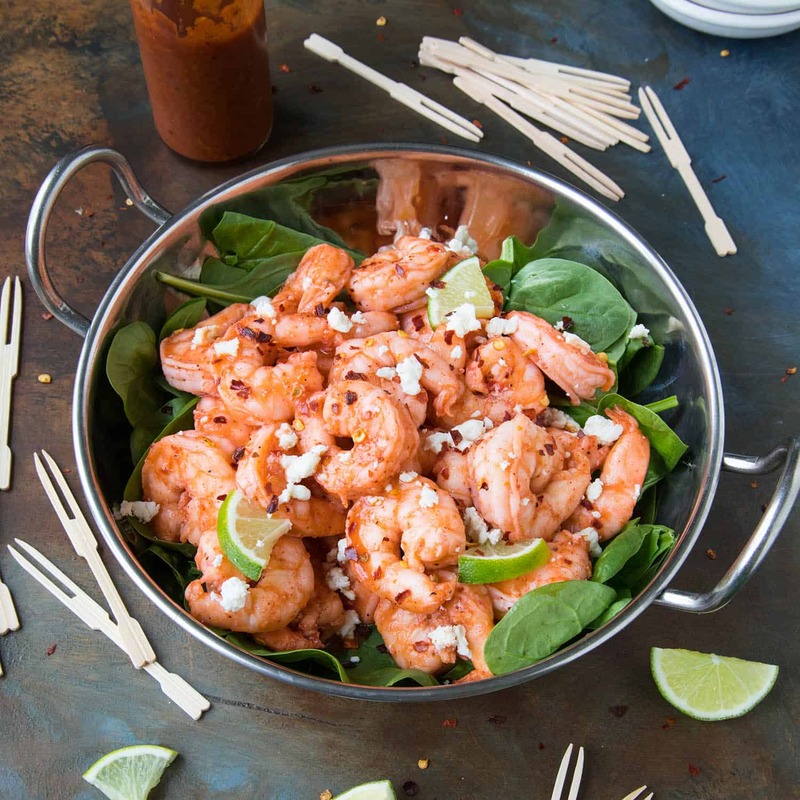 Bust out your grills for this recipe of quick grilled seasoned shrimp tossed in a homemade spicy and tangy Buffalo sauce. Perfect for summertime grilling and easy party food, dinner or appetizer. Are you in NEED of a quick and easy dinner recipe? Or perhaps a LAST MINUTE appetizer that you can toss onto the grill super fast? A recipe that will satisfy just about EVERYONE? Even the pickiest of eaters? Here it is! 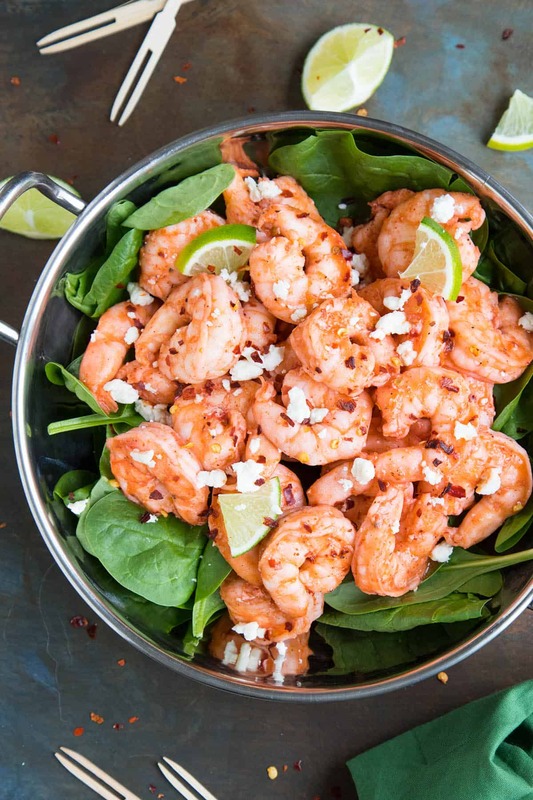 Grilled Buffalo Shrimp. 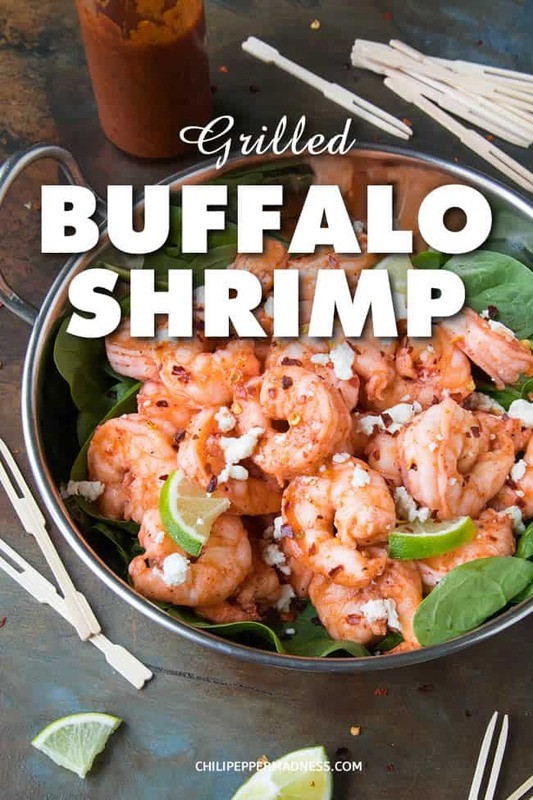 These Buffalo Shrimp are grilled instead of breaded and fried like your typical Buffalo Shrimp, making them healthier to serve, but also MUCH FASTER to bring to the table. That’s a HUGE bonus, right? Especially if you’re a slow cook like I am. I can’t help myself! Let’s talk about how we make them, shall we? First, peel and de-vein a pound of shrimp and dry them. Toss them in a bowl with red pepper flakes and salt and pepper. Heat your grill to medium heat and lightly oil the grates. Grill the shrimp a few minutes per side, until they are cooked through and nice and pink. 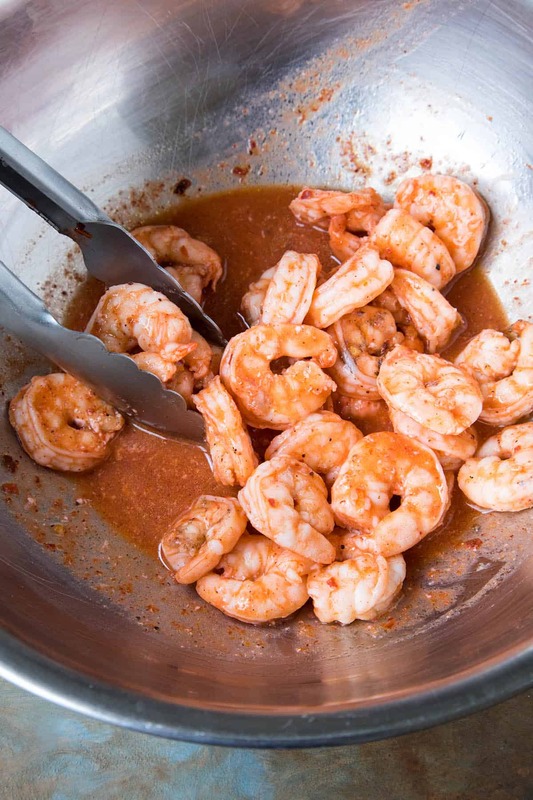 While the shrimp are grilling, whisk together your preferred habanero hot sauce, melted butter, Worcestershire sauce and vinegar in a small bowl. This is your Buffalo Sauce. 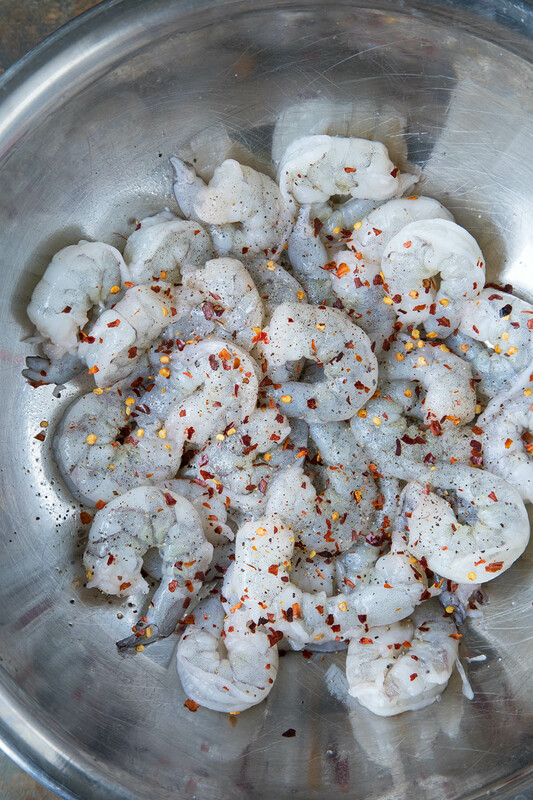 Toss the cooked shrimp in your sauce to get them nicely coated. I served mine over some spinach leaves and topped them with crumbly white cheese and a few slices of lime. AND! Some extra spicy chili flakes because, you know, I like to spice things up a little. I used a Homemade Garlic-Habanero Hot Sauce Recipe for this particular sauce, but realistically, you can use your own favorite habanero hot sauce. If you’d prefer to dial back the heat a bit, skip the habanero hot sauce and go with a red hot sauce of your own preference. A good Louisiana style hot sauce would be ideal for this recipe. Or, try my other Homemade Buffalo Sauce Recipe and see how you like that, too. Serve in a bowl and top with crumbly queso fresco along with toothpics for easy grabbing. Top with lime slices. Try some of my own Homemade Garlic-Habanero Hot Sauce Recipe. 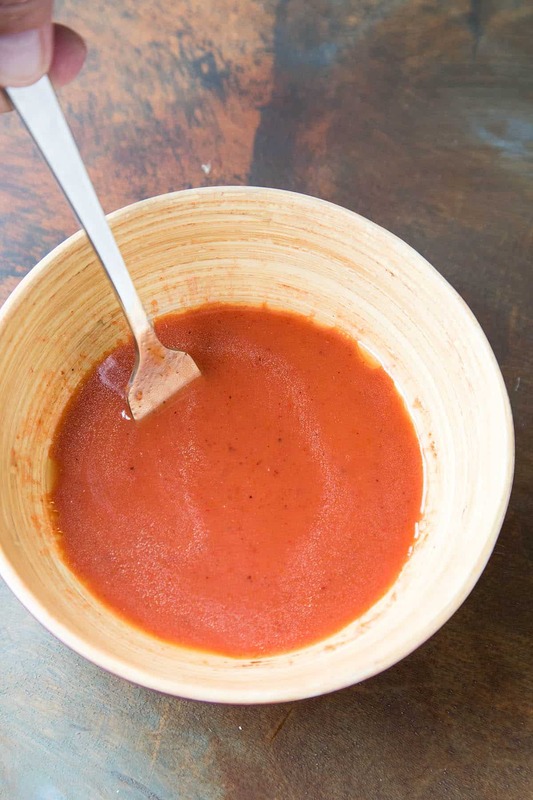 Also, try this Homemade Buffalo Sauce Recipe as well. These sounds like a new fave of mine. I love shrimp and anything tossed with buffalo sauce. It’s a match made in heaven! Thank you, Jacque. I totally agree! Thanks, Chris! I appreciate it, man! 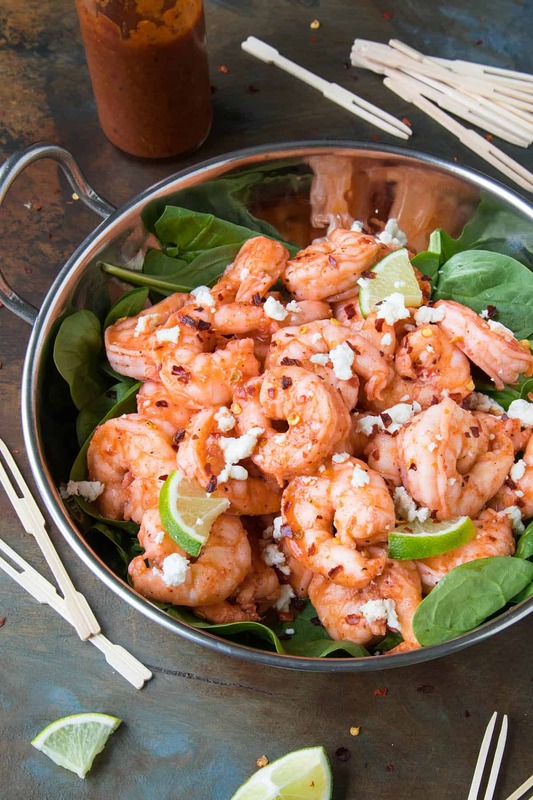 Many good things going on in this recipe, shrimps and spicy sauce I am in! Perfect party food that everyone will love. Thanks, Adriana. I think so! This looks so amazing! I need to make this asap! Let me know how they turn out for you, Jessica! 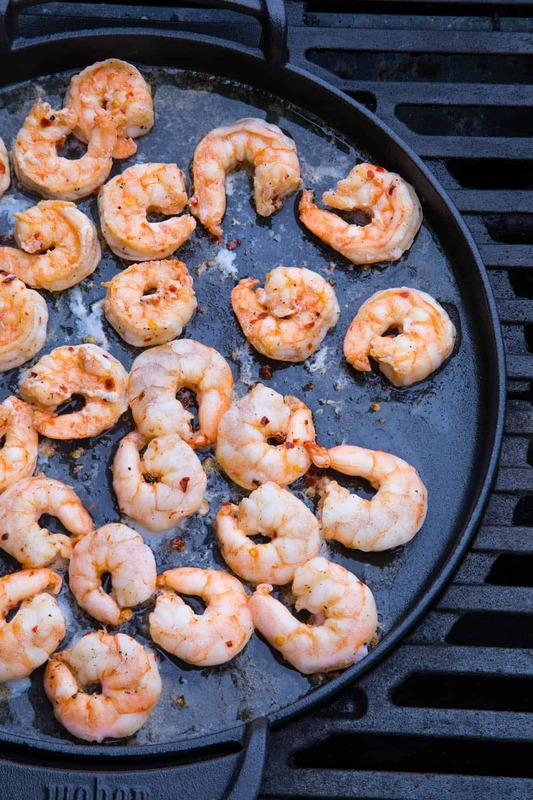 These grilled shrimp look so good! Tossed in that sauce, I am sure they are just bursting with flavor. Do you ever make your own hot sauce? Or just use a store bouyght brand.? Thanks, Chef. Yes, I LOVE making homemade hot sauces. Got a TON of them on the site. See my Hot Sauce Recipes. Total FAVE of mine. Yes! What a great idea to go the buffalo sauce route. Very smart! I love grilled recipes for the summer!